The World Cup may be completely analog, but don’t tell that to crypto developers. 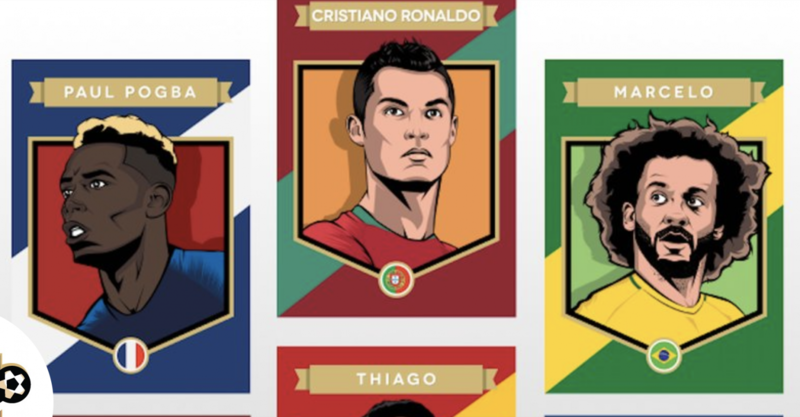 Soft launching now, a new company called CryptoStrikers is entering the so-called “crypto collectibles” market with tokens commemorating the stars of this year’s World Cup. The thing is the tokens it’s offering aren’t the same you’ll see listed on a popular market index like CoinMarketCap. Rather, CryptoStrikers is the latest example of something called an NFT, or a non-fungible token, a term that just might be becoming the buzziest product category in blockchain today. That’s because while they first got noticed when CryptoKitties went viral, NFTs continue to garner attention from entrepreneurs. Validating that idea, Status, one of last year’s biggest initial coin offerings (ICOs) has backed the company behind CryptoStrikers as the first inductee in their new accelerator. “By providing radical transparency of ownership and authenticity through the use of smart contracts, CryptoStrikers has enhanced the experience of collecting sports cards,” Status’s Ben Morris told CoinDesk. And it’s not just digital sports cards, just like it wasn’t only about digital kittens, that makes industry stakeholders salivate over NFTs. Whereas one bitcoin is effectively the same as any other bitcoin (they are fungible), each NFT token is unique and as such, may be valued differently by the market. Each token (whether it represents a cat or a soccer player) has different attributes that its home website’s software uses to generate the look of its avatar – including hair color, nose shape, outfits, age and rarity. Because NFTs have specific qualities that should play to people’s interest in real-world collectibles, crypto insiders hope they can bring the general public into the ecosystem. They’ve already done so somewhat, a point investor Arianna Simpson of Autonomous Partners spoke to in a Q&A on Token Daily in April. Amitt Mahajan, cofounder of NFT online marketplace Rare Bits, agrees. “People’s relationship with digital items is about to change,” he said, pointing to the fact that digital books and movies people buy online can’t then be resold or traded because of their strict licensing. And each time an NFT has blown up, it’s adapted the model by adding a new mechanic. To game makers, “mechanics” are an action the rules of the game allow players to take. For example, in the card game “Go Fish,” asking for a card from your opponent would be a mechanic. The most interesting games tend to mix up a few mechanics that can combine in surprising ways. While we’re just in the earliest days of NFT game play, already the industry has iterated on the simple mechanics of holding the tokens. For instance, CryptoKitties allows users to breed their cats, creating a new, unique kitten with a mixture of attributes from its parents. Crypto All Stars, a collectible token game where players “owned” avatars of famous people in the industry, had a snatching mechanic. If someone bid a price 20 percent more than the last person had paid, they got the token whether the previous owner liked it or not (although the previous owner got a profit, too). And CryptoStrikers has its own compelling mechanics. Currently, CryptoStrikers offers two different packs of four cards. The standard pack sells for 0.025 ETH and will go off the market on July 15. The premium pack (there are only 500 of these packs available) is more likely to contain very rare cards and went up for sale on May 14 for 0.05 ETH. Intriguingly, on Thursday, it was also offering standard packs in exchange for CryptoKitties, though this offer was only good for a limited time. That may have been because creators were trying to signal that their project has similar significance to the original ERC-721 token, whose cute cats made ethereum almost unuseable in December. But above that, CryptoStrikers adds a mechanic whereby users don’t know which cards they will get in their purchased pack, just like with physical sports cards. And as their real-world counterparts, CryptoStrikers has built a trading platform into its website that allows not only for trading between cards but also selling the cards for ETH. CryptoStrikers declined to comment to CoinDesk. But building out new mechanics doesn’t have to be relegated only to the game’s developers. Because NFTs are decentralized, the codebases are open-source and can be used by other entrepreneurs or enthusiasts to create new user interfaces or game play on top of it. For instance, entrepreneurs took CryptoKitties code and built two separate applications for the fluff balls – KittyHats, which allow users to purchase accessories to adorn their kitty and KittyRace, a race car game that allows the kittens to take the driver’s seat. One way to start envisioning the future of NFT is by looking at the evolution of trading card battle games. Magic the Gathering is a wildly popular collectible card game of monsters and mages on paper decks. Its creator, Wizards of the Coast, released the first set in 1993 with a ruleset for playing the game, but it wasn’t long before fans started developing their own games with the cards. Then Blizzard released Hearthstone in 2014, a super popular digital card game played over the internet. It shares a lot of characteristics with Magic but, because it’s computerized, it can add fun effects and interactivity that Magic can’t. Yet, because it was created by a centralized company, cards can’t leave their initial platform and users can only play the games its makers provide. Several NFT providers have begun iterating on this idea. According to Status’s Morris, CryptoStrikers seems headed in that direction. “As an open source project, we really liked their vision of having the community build their own games and applications on top of their platform,” he said. And another company, Myethereum, is in that arena as well. Still, most NFT enthusiasts agree that the industry has a long way to go when it comes to user experience. The interfaces for these games are buggy and confusing. In purchasing two standard CryptoStriker packs to test out the game, I found that moving them to auction was slow and cumbersome, taking a surprising number of steps that burned a lot of ether in gas fees. And user experiences like this can break a game. But that’s also more about the ever-evolving decentralized application (dapp) layer that’s being built on blockchains. And currently that’s still not exactly the vision everyone expects. Even with a significant amount of initial buzz, these projects haven’t succeeded in garnering the user base that more traditional apps have, plus apps have struggled to keep the users they do entice occupied. As we previously reported, the biggest dapps aren’t that big. Status, which is sort of like a WeChat for ethereum users, plans to chip in to making NFTs more user-friendly by incorporating the technology into its platform, according to Morris. So, for example, Status users will be able to give and receive NFTs over chat, which could really advance the trading aspect. But even more forward thinking is Hines, who imagines a future where every Instagram photo is an NFT and its owner can earn revenue when other’s license it. On top of that, celebrities and brands could sell updateable photos, building an ongoing relationship with fans and limitless upselling opportunities. Imagine, Hines said, if Justin Bieber sold an NFT photo of himself on an app, and then the fan who owned it met him in real life and got him to “sign” that photo. “Now you can update it so his autograph is forever tied to that item,” Hines said. But there’s a lot of technology, especially scaling technology, that needs to be built between here and there.